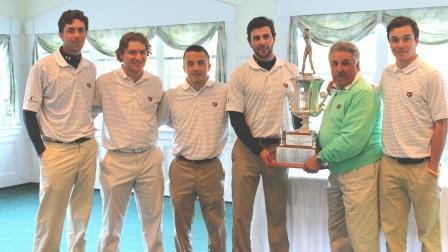 FAIRFIELD UNIVERSITY SHOOTS A TWO-DAY TOTAL OF 601 TO WIN THE 80th ANNUAL NEIGA CHAMPIONSHIP. BENTLEY'S MALCOLM OLIVER MEDALIST AT 1-UNDER. Brewster, Mass -- Teams from 37 colleges and universities across New England and New York gathered at The Captains Course in Brewster, MA, on Sunday and Monday, October 26-27, 2014 for the 80th Annual New England Intercollegiate Golf Championship. One hundred and eighty golfers from Divisions I, II, III and Club teams competed. The NEIGA was pleased to have Cleveland Golf / Srixon return as the ‘Presenting Sponsor”. The New England Intercollegiate Golf Association (NEIGA) has been in existence since 1934 and includes 37 member colleges and universities in New England and New York and is considered to be the oldest and largest college golf tournament. It is unique in that Divisions I, II, III and Club teams compete together. Division I Fairfield University, under the leadership of Head Coach Len Roberto, shot a two-day total of 601 to win the overall championship. They were six strokes better than runner-up UMass Lowell. Day 1 medalist Matt Hills of Central Conn. State University was the individual medalist for Division I with a two-day tournament of 146. Bentley University, led by Head Coach Mickey Herron, won the Division II title with a score of 608, beating Southern New Hampshire University by six shots. Bentley’s Malcolm Oliver was the DII and overall medalist with a two-round, 1-under par total of 143. Rhode Island College, guided by Head Coach Greg Gammell, took home the Division III crown with an impressive 615, a whopping 14 strokes better than runner-up Babson College. Endicott College's Austin Teal was the DIII medalist with a two-round total of 147. Cleveland Golf/Srixon sponsored the long drive, sand bunker and putting contests. Winners were John Abbott of Franklin Pierce University (Long Drive), Harry Hulme of UMass Lowell (Sand Bunker) and Hunter Byram of Franklin Pierce University (Putting). The NEIGA made several special presentations. The 2014 Guy Tedesco Award recipient was Kevin Wheeler from Nichols College. This award is given annually to the Outstanding New England College Golfer who displayed the qualities Guy Tedesco was noted for: unselfish leadership, outstanding talent, love of golf and willingness to promote positive aspects of golf to others. The Gordon McCullough Award given to the “Coaches Honoree” was presented to Coach Frank Driscoll of Saint Anselm College. Bentley Head Coach Mickey Herron was presented the President's Award as outgoing NEIGA President. The George A. Jacobson Special Recognition Award was presented to Massachusetts Golf Association Executive Director Jesse Menachem for his years of dedication to promoting the game of golf.